In mid-1874, the Ponce de Leon line of horse-drawn railcar lines in Atlanta was extended to reach Ponce de Leon Springs, rumored to keep one young by a local physician, and immediately became a popular day-trip among Atlantans hoping for rest, relaxation, and a little rejuvenation. In 1889, Fulton County Street Railroad Co. electrified the extremely popular line with a streetcar system powered by Thomas-Houston Electric (who 3 years later merged with Edison to form GE) and extended the route to include a loop through what is now the Virginia-Highlands. As the second-ever electric streetcar in Atlanta (both launched in 1889), the Nine Mile Circle Ride, also called Nine Mile Trolley, was born and quickly became the most popular line of the 1890s. From the rooftop of Ponce City Market, 9 Mile Station evokes the memories of its namesake from bygone days, where the fresh rooftop breeze recalls the cool wind of a relaxing country ride whipping through your hair. Fortunately, 9 Mile Station offers a much more satisfying view of all three of Atlanta's phenomenal skylines mixed with the foilage of the city's green canopy along the Beltline, Piedmont Park, and all 4 local neighborhoods that merge at Ponce City Market. 9 Mile Station is an elevated beer garden in the heart of Atlanta, featuring a sleek indoor-outdoor space offering sweeping unobstructed views of Atlanta’s skylines spanning Buckhead, Midtown & Downtown. Whether feeling the flashes of heat from the open kitchen in our intimate dining room, or the tingling of a cool breeze under the stars on our rooftop patio, you will be engulfed in that old southern hospitality and charm that marries an affinity for simple, rustic ideals and elevated elegance. 9 Mile Station serves craft beers from near and far, classically-prepared cocktails, and delicious, shareable food. Jonathan McDowell brings 18 years of experience in the hospitality industry prior to his role as executive chef at 9 Mile Station. Born and raised in Los Angeles, his passion for cooking began in his grandmother’s kitchen in Tennessee, where he spent summer vacations as a child. With her encouragement, he decided to pursue a professional career in cooking and obtained a degree at the California School of Culinary Arts in Pasadena, Calif. Following school, McDowell started as a prep cook with 20th Century Fox Studios, entremetier at Patina, a Michelin-star rated French restaurant in downtown Los Angeles, and sous chef at Saddle Peak Lodge in Calabasas, Calif. While living out west, McDowell was inspired by acclaimed chefs Eric Greenspan, Theo Schoenegger and Warren Schwartz. Since moving to Atlanta in June of 2010, McDowell worked as executive chef at local restaurants such as Roya Mediterranean Restaurant and Tapas Bar, Evoo Tapas Bar and Barcelona Wine Bar. This inspired his love for approachable, shareable food that brings friends and family together and enhances a sense of community around the table. Originally from Louisiana, Ryan brings more than two decades of experience to his role as General Manager. Although he originally dreamed of being the next Dave Grohl, Crocker has worked his way up the old-fashioned way, starting as a dishwasher, then moving to serving, line cook, chef and eventually General Manager. Crocker moved to Atlanta in 2006 to attend Le Cordon Bleu. Upon completion, he worked in acclaimed chef Richard Blais' kitchen at Element Food Lab as well as local staple Kevin Rathbun Steak before becoming the Executive Chef at The Albert. He then went on to be the General Manager of GRAIN, Cypress Street Pint & Plate, and Hampton & Hudson, before leading the launch of 9 Mile Station. Crocker has developed a guest-centric philosophy with a fixation on crafting amazing experiences. He is ever focused on stocking the 9 Mile Station staff with like-minded people wanting to elevate special occasions and celebrations. Outside of the restaurant, Crocker can be found jamming out, cooking and spending time with his wife and dogs. With experience all over the Southeast, Randy Hayden has honed his 21 years of experience to provide the perfect potable compliment to 9 Mile Station's culinary offerings. Growing up in Atlanta, he immediately jumped in the cocktail scene at age 18, quickly becoming the Head Bartender at Roy's Hawaiian Fusion in Buckhead. He then opened Kevin Rathbun Steak as Head Bartender, where he gained experience in high-end clientele, mastering high-end service and furthering his wine knowledge. He then spread his wings to Florida to become a Buyer for Chan's Wine World, where he traveled the world tasting wines at various vineyards under industry titan Chan Cox's tutelage. He also began mentoring under mixology legend Nick Nistico, who perfected his cocktail knowledge. Hayden then began freelance consulting on beverage programs in Florida and Nashville, opening everything from dive bars to celebrity chef-owned to fine dining to upscale fusion, before returning to ATL with 9 Mile Station. Hayden believes a beverage program should be focused and balanced, fully-rounded with no weak points and equal attention to all aspects. The beer garden focuses on unique and specialty-sourced brews with excellent relationships to local suppliers. 9 Mile's wine selection focuses on classic styles and quality over specific varietals or regions. Hayden's love for food and flavor pairings guide the mentality behind each cocktail recipe and build, balancing taste, texture and spirit. All programs rotate seasonally to account for ever-evolving preferences and industry progression. 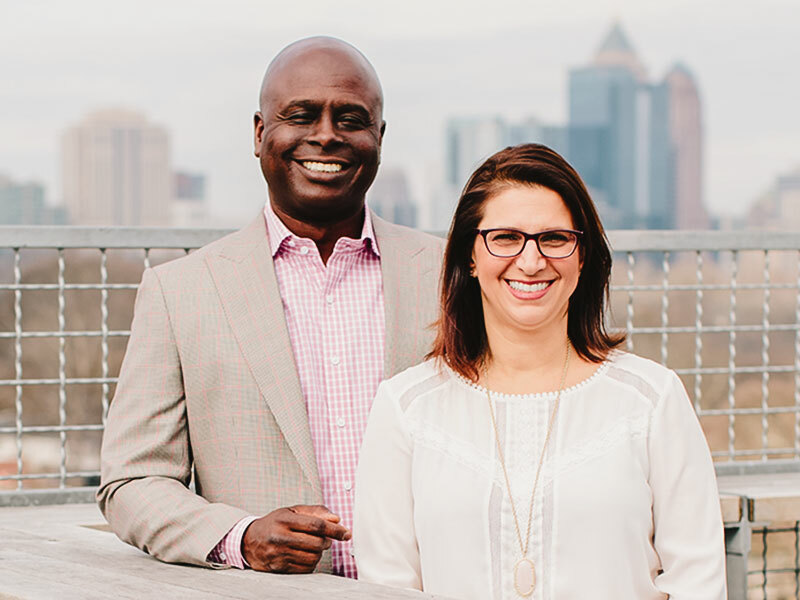 Originally from Florida, Kelvin and Mandy have called Atlanta home since 2000. With over 50 collective years in the restaurant business, both corporate and family-owned, the Slaters have spent their entire working lives in hospitality. After starting their own concept in 2003 and later selling that burgeoning chain in 2015, the Slaters turned their attention to Ponce City Market for a new challenge. 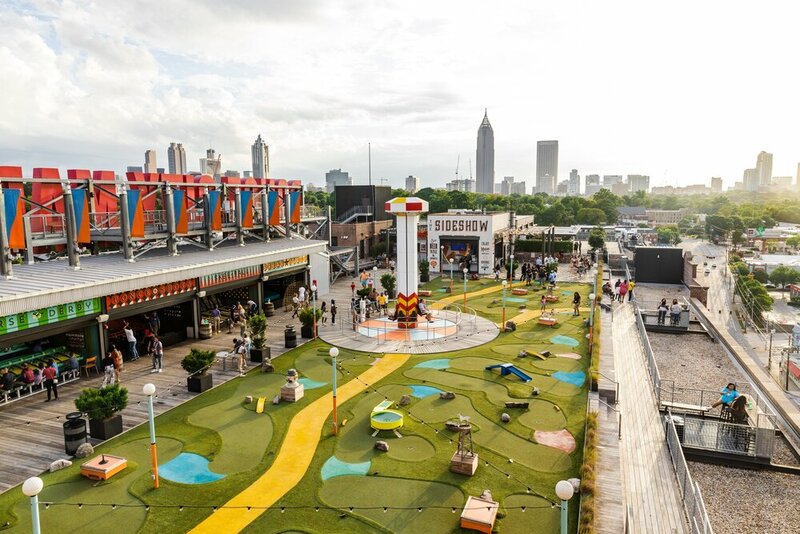 After careful consideration and due diligence, they pursued this venture to turn Ponce City Market's latent rooftop into the boisterous and invigorating entertainment, dining, and private events nexus for midtown vibes and Atlanta's best skyline views. By focusing on making sure each and every guest feels special and as if they were guests in the Slater's own home, this meticulous approach to hospitality has propelled 9 Mile Station to the forefront of the Atlanta restaurant scene, firmly establishing itself among the must-see-and-eat destinations of the South. This birthed the Slater Hospitality mission to create unforgettable experiences their guests rave about. Outside of The Roof, Kelvin's passion lies in mentoring and helping others grow, both personally and professionally. This devotion is realized through serving as the Chairman of the Board for the Georgia Restaurant Association and as a Board Member of Atlanta's Entrepreneurs' Organization. Mandy's passion naturally revolves around serving others as she volunteers countless hours at their church and in their community and mentoring women in need of direction in business and finances. At home, family is the foundation and they remain endlessly devoted to their two lovely children, and dog, Ginger.